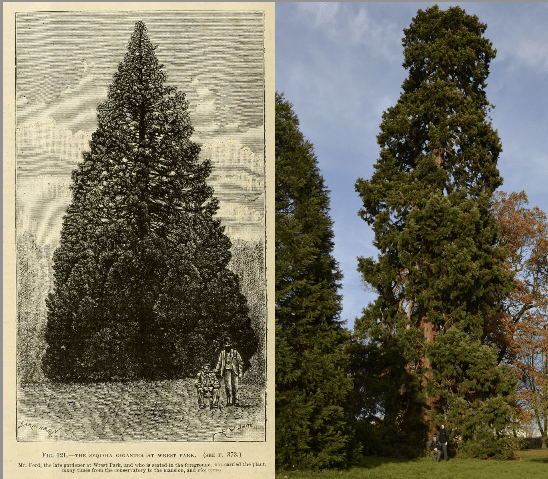 Originally planted by the festively monikered Head Gardener of Wrest Park, Seward Snow in 1856, the Sequoia Gigantea was brought into the conservatory each year by his successor George Ford for Christmas and replanted outside once the festivities were over. The picture on the left is of the tree after it got too big for the house, from The Gardener’s Chronicle in 1900, showing Mr Ford (seated) and his replacement George McKinlay. Mr Ford even retired on Christmas Eve in 1896! The image on the right is of current Head Gardener Chris and apprentice David, in front of that very same tree, now standing at 30m tall. English Heritage think it’s one of the most impressive, if not oldest recycled Christmas tree in the country. After decades behind virtually closed doors, its treasures overgrown and largely unknown, English Heritage is reviving one of Britain’s largest and most important ‘secret gardens’ – Wrest Park in Bedfordshire. This wonderful 90 acre historic landscape and French style mansion will take its rightful place amongst the country’s great garden attractions and give locals and visitors to Bedfordshire a superb new day out. With the opportunity to stroll in the recently restored Italian and Rose Gardens and enjoy miles of reinstated historic pathways, visitors can discover the garden buildings, pavilion and statues. They can also find out more about the garden and the people that shaped it, in the new exhibitions in the house and garden buildings. Visit the English Heritage Wrest Park pages to discover more.